So in all honesty, I am a child in the kitchen. At age 36 you would think I would know better, but no, complete and utter novice. I have baked biscuits and made a few stir-fries in my time but ‘proper’ meals? Not really, not in a consistent way anyway. I have been living with a guy who was a chef/cook for a restaurant and so I became so slobbishly lazy in the kitchen over the years. He has been cooking for 9 years now, with me occasionally cooking. Yes, I feel some embarrassment at my laziness, but 2013 is a time of change for me and one of those is to become independent. To do this I need to know how to cook and this ties in nicely with my need to eat more purer food, less gluten and food more balanced for my body and changing taste desires. Tonight was my first experiment with cooking and I am very proud of how tasty it turned out. Now you may be looking in shock at how little I know how to do but you could also be another 30 or 40 or 50 something who has lived off readY meals, had someone else cook for you or are student with no idea on how to do anything lol!! Me, I did not even know what dicing meant, chopping or slicing. 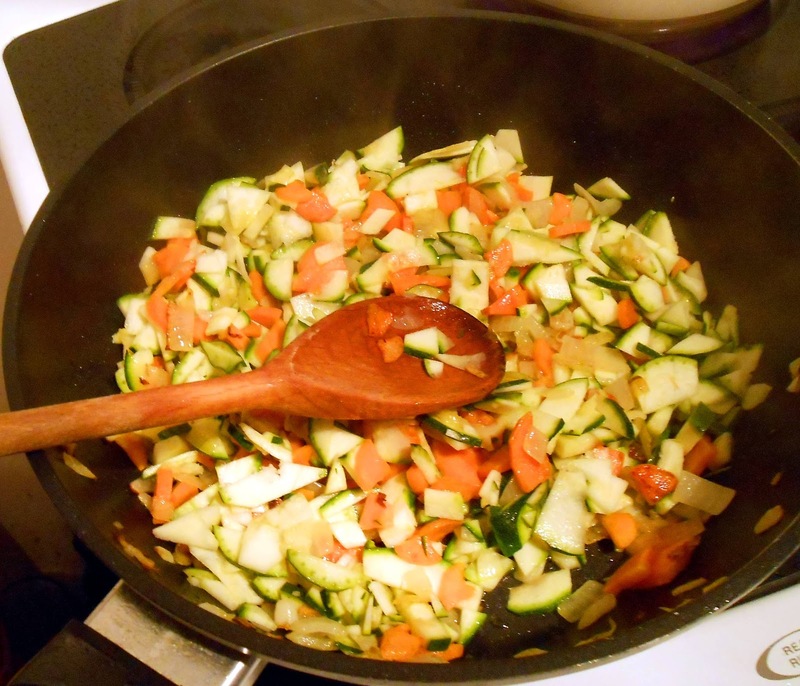 What way do you chop a courgette (zuchini)?, what is the best way to dice carrot? Seriously, no idea ! I was lucky enough to have my trusty cook Michael at hand where I asked lots of basic questions about cooking, how to use the oven (don’t laugh – we have a new oven and I have never used it LOL!). What heat do you put things on? How much oil? Go on… laugh… I don’t mind. Oh and chopping a sweet potato is not easy, I have a knife phobia LOL! So here is the recipe for this delightful gluten free dish. And while my finished product does not look like the picture (I needed to add more filling and more mash) it turned out rather scrummy! Now, what would I say as a virgin cook cooking this dish? Well like most recipes the timing tends to be more than they estimate. I think maybe its to encourage make people cook as they think it will not take long. This took me in total, as a newbie slicer, dicer and cook, a little over 1 hour and 30 minutes (this includes cooking time). 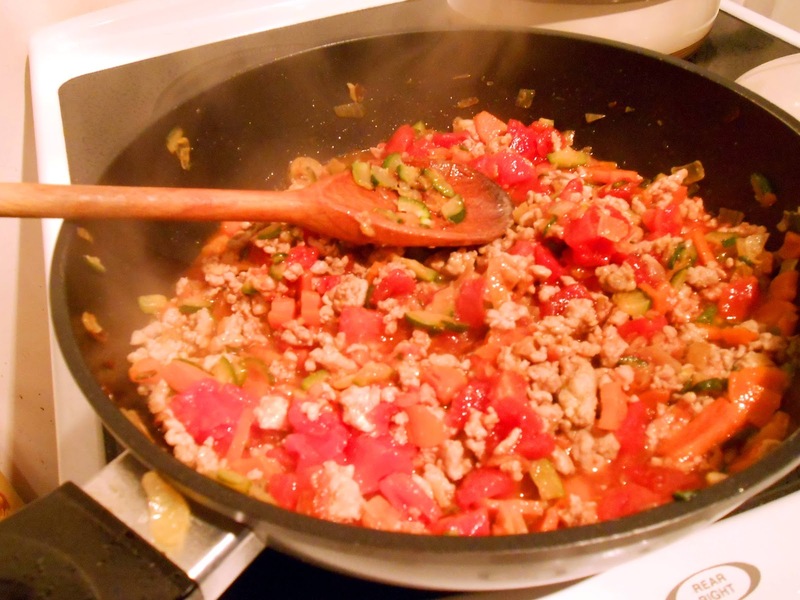 I used pork mince instead of beef and it was tasty, also a lot cheaper for those on a budget. My kitchen is the size of a box and my utensils are old but they work. So if you have a small kitchen like me you will be more than able to make this. 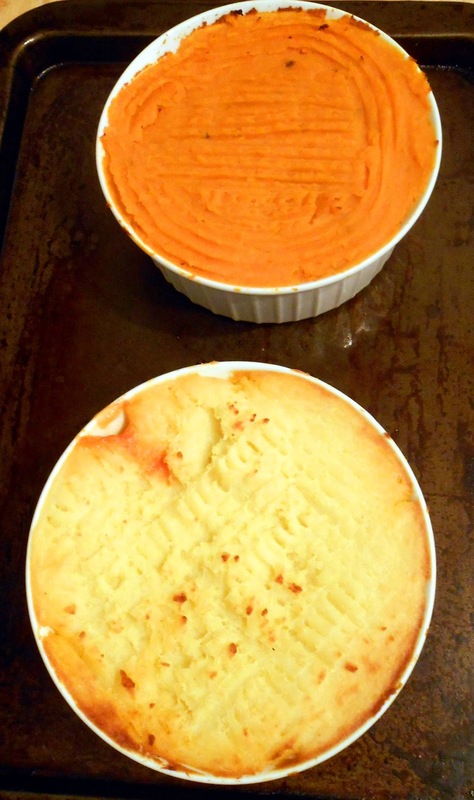 If you want your mash to look all pretty over the top of your cute dish put more filling in the dish. 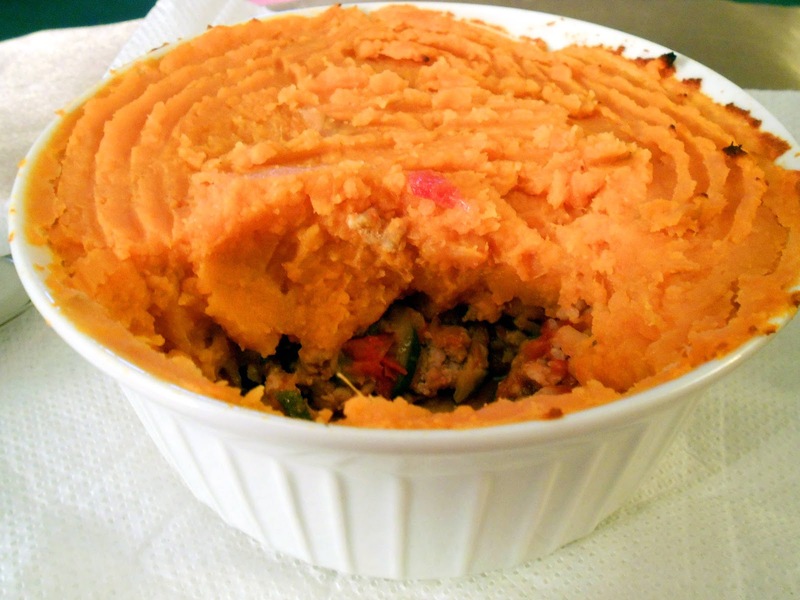 And if you are not a fan of sweet potato you can use normal mashed potato, Mike had this as his topping as he hates sweet potato. I personally had it on its own with no side salad, but its probably lovely with a salad too. Now it says little pies and is for 4 servings, my ingredients made 2 (and a bit) servings for larger dishes. So it could be a normal size pie without side dish. I had some left over filling so I put that into a tin and put it in the freezer for future use (go me!). And here is my little photo journey of love haha! 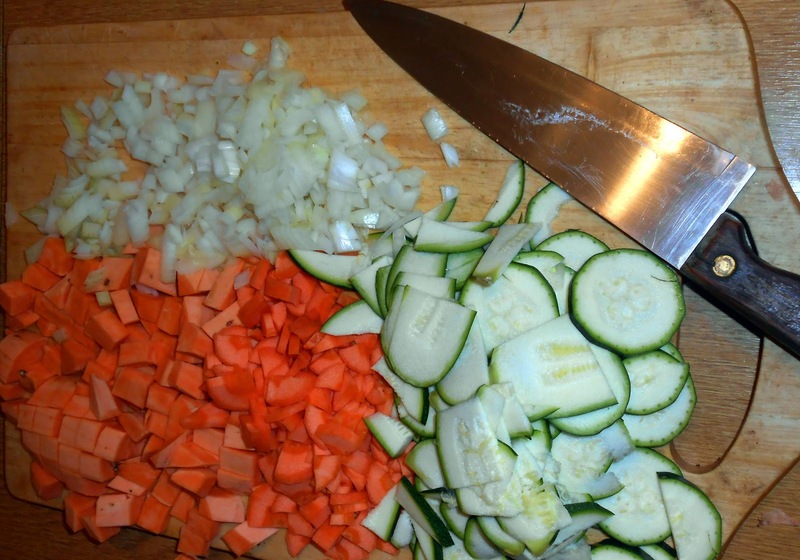 diced and then I sliced thinly my courgette -wrong-. It did get sliced properly after I made the mistake by Mike, otherwise it may have taken longer to cook and not tasted so yum! 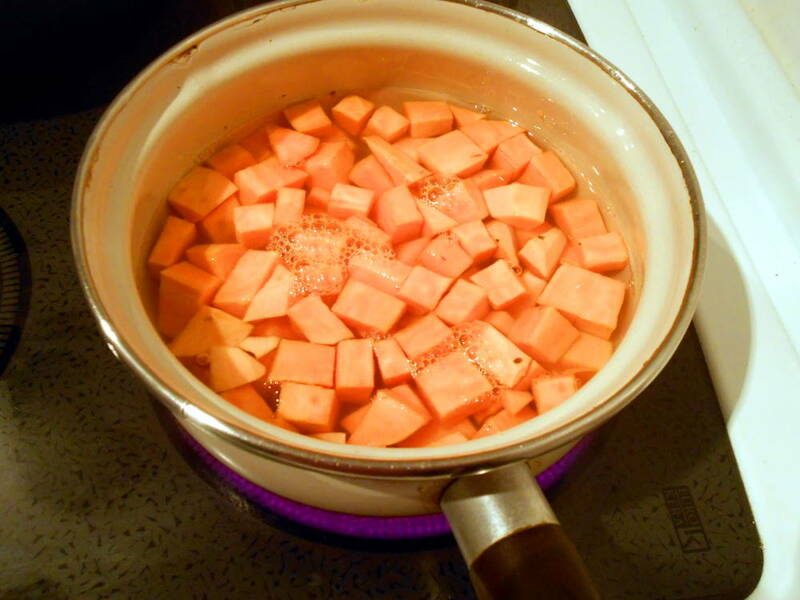 In one of our ancient pans, sweet potato simmering away to soften for the mash potato topping. Onions and carrots browning off in sunflower oil (we did not have olive). Added the courgette after it was sliced properly. Added the tin of tomatoes and pork mince until it had thickened. 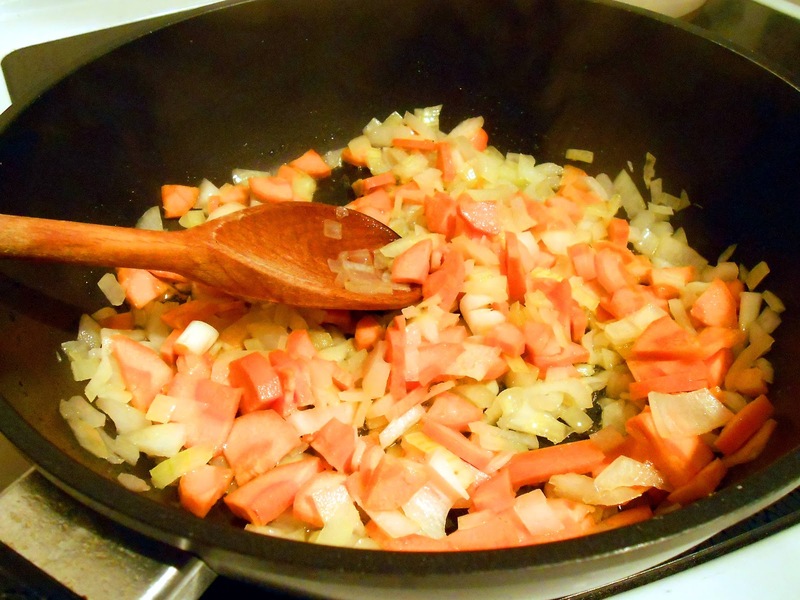 (see onions on handle of pan – yes >>> messy cook!). Ta da! Already devouring the dish. While the flavour was plainer than Mike liked I absolutely loved the subtleness and purity of the flavours. This is exactly what my body wanted. These do not look ‘foodie’ fantastic but they tasted delish! And there you go! My first step into the kitchen of my own independence. And my first ever gluten-free pie. If you are looking for a new healthy eating plan for eating this year check out the site above I will be trying many of the recipes over the coming year and anywhere else that has tasty looking gluten-free dishes. Thanks Rach, I enjoyed making it, will be making another meal on Friday.